Thermoplastics make up most of the types of filament used in fused deposition modeling. Filament made from thermoplastic materials can be used in 3D printing to create many different colors, even transparent or glow-in-the-dark. Variations in the material qualities of different filament types create potential difficulties if you decide to change from one filament type to another while printing. Even so, halting a printout in the middle to change the color of filament is a common way to enhance the attractiveness of a product. This 3D-printed puzzle bolt makes another use of paused printing — adding the nut to the bolt as it’s being fabricated. One of the most commonly used thermoplastics in 3D printing is PLA, an environmentally friendly and biodegradable polymer created from plant sugars from crops such as tapioca, corn, and sugarcane. This material can be printed using a print bed covered with painter’s tape and does not require a heated build plate. PLA melts at a very low temperature, around 160 degrees Celsius, although it bonds better around 180 degrees Celsius, and most PLA printers direct a small fan at the extruder to cool the material as it is added, preventing the hot end of the extruder from re-melting the previous layers. PLA can be more brittle than some other thermoplastics, although specialty versions are being developed for increased flexibility and a reduced carbon footprint during the material’s creation. PLA is used to create rain-collectors and pipe fittings in many less-developed parts of the world, along with simple sanitation products like toilet seats. It is somewhat more brittle than ABS, less flexible than nylon, and so remains one of many options in use today in developed areas. If used in a confined area. ABS has a mild odor during extrusion that can affect chemically sensitive birds and people. ABS is also said to produce more airborne microscopic particles than PLA without adequate air filtration. Polycarbonate materials such as Lexan are a recent addition to the available thermoplastics used in 3D printer filament. Polycarbonate applications include CD and DVD media and automotive and aerospace components, due to its high resistance to scratches and impact. 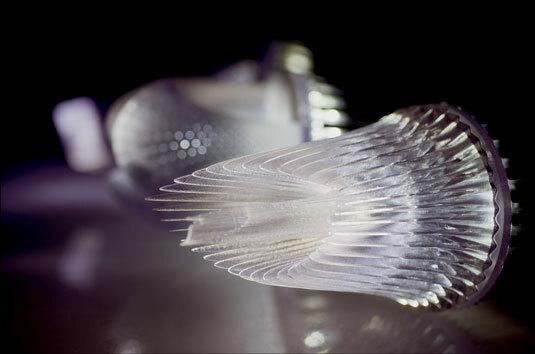 Although polycarbonate plastics are used in the creation of “bulletproof glass” when poured into forms, the layering in 3D printers creates microscopic voids between layers so the final result will not be as strong as molded industrial equivalents. Polycarbonate objects can also undergo a change in state when exposed to ultraviolet light, becoming more opaque and brittle over time. Nylon filament is another recent addition to 3D-printing options, especially useful for objects that require flexibility and strong self-bonding between layers. Nylon thermoplastic filament requires extrusion between 240 and 270 degrees Celsius, and has excellent layer adhesion. Nylon is also resistant to acetone, which dissolves materials like ABS and PLA. In addition, polyamide materials can be opaque, transparent, or even dyed to different colors using common clothing dyes meant for nylon fabrics. In addition to its resistance to acetone as a solvent, nylon can produce good flexible vessels such as vases and cups. 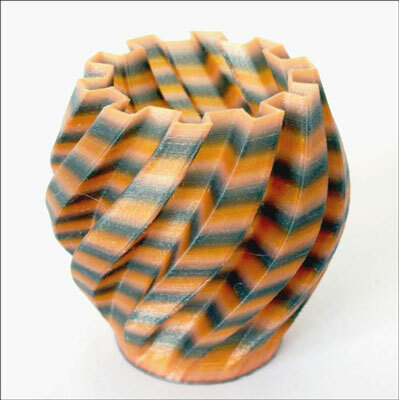 Richard’s “tie-dyed” nylon filament allows for the creation of unique objects with color combinations along the length of a filament without requiring splicing or halting print jobs in the middle. A popular option for water-soluble support is polyvinyl alcohol, a biodegradable industrial adhesive material extruded between 180 and 200 degrees Celsius. 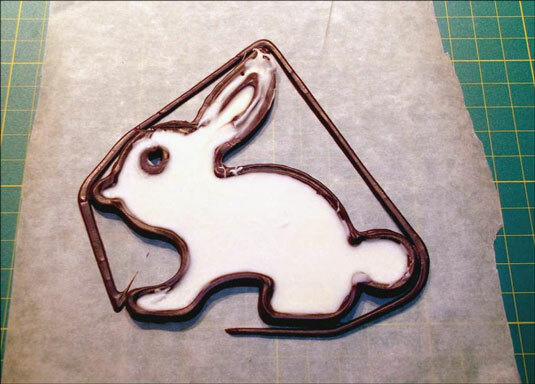 Some varieties of PVA are conductive and can be used to 3D-print electrical circuits directly into fabricated objects. PVA is most commonly used as a support material for other types of thermoplastic, because it dissolves away in water to reveal the completed plastic object. Another soluble support material that is recently available is HIPS, a variation of styrene, the same material used in packing material and food containers. HIPS has similar properties to ABS but dissolves in limonene, a biologically derived solvent made from citrus plants, rather than using acetone like ABS. HIPS filament is relatively new and its use is still experimental. Like PVA, HIPS is used primarily as a soluble support material. HDPE is the thermoplastic material used to create bottles and other recyclable items marked as “Number 2.” Because HDPE is easily found in recycle bins and in landfills, the use of HDPE scavenged from recyclables like milk jugs is generating interest. HDPE binds easily to itself, but it has difficulties binding to other materials, so it often requires the use of an HDPE sheet as the build plate. Because it is more difficult to work with, HDPE is not popular for 3D printers but its sheer availability as a byproduct of many industrial applications is encouraging efforts to apply this material for additive manufacturing. Students at the University of Washington have used extruded HDPE to create boats for a local milk-jug regatta competition and recently won a contest to use recycled HDPE in 3D printers to fabricate toilet seats and water-collection components for Third World areas. The sheer variety of containers fabricated using HDPE makes this material readily available, allowing one nation’s trash to be recycled as useful products once techniques for adapting recycled HDPE to 3D printing are more mature.